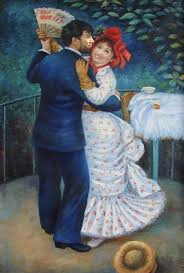 If it was possible to judge an artist's character solely by his work, I would have to say that Renoir was a very jolly, happy and nice man. His works are not at all tortured or dark. 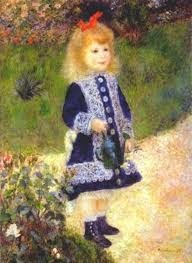 Renoir was one of the first group of artists who created Impressionism so his legacy is undoubted. He lived until he was almost 80 (although he was very badly affected by arthritis in his last years). He was famous in his own lifetime and was able to go to the Louvre and see his own work hung there. He died the year after WWI ended – in 1919. 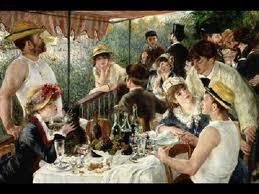 While I have seen the many Renoirs at the Museé d'Orsay in Paris, I have now found out that the largest collection of Renoirs is in fact at the Barnes Foundation in Pennsylvania. Renoir didn't paint fine art from early on. In fact he worked as a porcelain painter. He started on fine arts in his 20's. Two of Renoir's sons became famous in the French film industry. Clearly an artistic streak in that gene pool. I've seen some at the Musee d' Orsay as well. There were quite a few at the Art Institute of Chicago last summer. I'd love to go to PA and see the museums and historical items there.